Hi guys! Hope you've had a great week. Did you get any snow? It was bitterly cold here and we had several snow showers but nothing that settled. Lots of rain too, so its been incredibly icy. Last Thursday there were three quite serious accidents within less than 5 miles of each other, so I think quite a number of people were taken by surprise. I must admit, I was more than a little pleased to be at home that day. 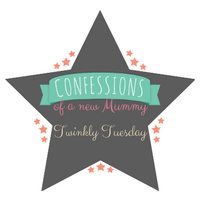 On to the week's Tuesday Twinkler with a post from Miller in the City, where Noleen shares a post about the puberty talk she has had with her eldest daughter. This struck a chord with me as I know sometime in the future it is a talk I'll be having with my two and, I must admit, the thought fills me with dread! But it has to be done and I'll be bookmarking this post for some pointers. Oh my thank you for choosing my post as your feature for this week. I'm glad that you got to sit that one out I think our bitter vortex cold is gone and normal January cold is settling in. It looks like we're getting that freeze over wet streets today and tomorrow. That is a talk I'm glad I never had to give, I'll have to check out the post out of curiosity.